Phoenix Park Inn is a charming, contemporary hotel, and a firm favourite amongst British holiday-makers. The hotel’s close proximity to Candolim’s shops, restaurants and beach – everything is within walking distance. The exotic spice plantations of Ponda are only one hour’s drive and are well worth a visit. Book yourself an excursion with your local representative and discover one of Goa’s most famous attractions. Set in the heart of Candolim, Phoenix Park enjoys a prime location, with ample shops and restaurants just a short stroll, plus the golden sands of Candolim Beach are also just 800m away, home to some of the best beach shacks in Goa. Spend your days sipping on refreshing cocktails and soaking up the Indian sunshine on the loungers for hire, followed by evenings filled with sumptuous fish suppers and chilled Kingfisher beers – what’s not to love? Back at Phoenix Park, the free-form swimming pool and terrace area are the hotel’s focal point, and are centrally located. Surrounded by palm trees, tropical plants and the guest rooms, there’s an added touch of seclusion and some welcome shady spots. The guest rooms boast views of Candolim village or the pool, and are set in six blocks. Each is stylish in design using a mix of neutral and pastel tones, with ample facilities including tea and coffee-making facilities and Wi-Fi, along with a balcony or terrace area. The hotel’s poolside restaurant, Chapora, serves Goan specialities and international cuisine, which is often accompanied by live music and local dance performances. The poolside bar, Sal, offers speciality cocktails and local light bites. "Location, Location, location. You could not be better placed to make the most of Candolim’s beautiful beach and extensive amenities." 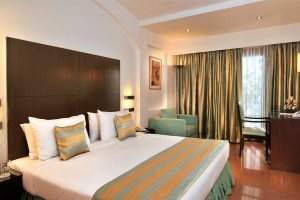 The Premier rooms are comfortably furnished and have either a balcony or terrace overlooking Candolim village. More modern in style, the Premier Pool View rooms have either a balcony or terrace overlooking the pool area.